We’re less than 24 hours away from the official, grand opening of Star Tours: The Adventures Continue in Disney’s Hollywood Studios. 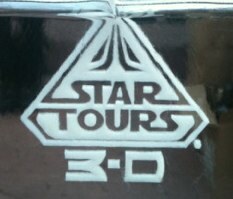 There are a lot of Star Tours Events, including the Star Tours 2 Press Event, which just started! If you’re going to be in the Studios tonight, early tomorrow morning, or if you’re just watching from home, be sure to head over to StarToursLive.com to get all the latest updates! I rode it on the soft opening last Saturday….holyfreakingawesome! The ride was so full of win!